Dr. Dua is an associate professor in the School of Women’s Studies at York University. She teaches feminist theory, antiracist feminist theory, postcolonial studies, development studies, and globalization. She is the co-editor of Scratching the Surface: Canadian Antiracist Feminist Thought. One of her current research projects focuses on the historical construction of the categories of nation, race, and gender in Canada. Other research includes immigration processes, women and health, equity policies, criminalization, and the racialization of masculinity and femininity, globalization, and biodiversity. Sharing Feminist Research on Social Policies and Collective. Research clusters were also established in Gender and Public Policy, Interdisciplinary Asian-Canadian Studies, and the Childhood Studies. Excavations, Collusions, and Contestations: A Symposium on Violence, Memory, and Memorialization. During this period, the Centre also had the privilege of hosting many scholars including Katja Kahlina from Central European University and Jin Haritaworn from Gender Institute London School of Economics and Political Science. During the 2010-2011 school year, we continued to support several research clusters such as the Gender and Public Policy, Interdisciplinary Asian-Canadian Studies and the Childhood Studies research clusters. Additionally, CFR established two new research clusters: a Memory Reading Group; and Feminist Cultural Production. This period also saw the continuance and development of several research projects: Envisioning Global LGBT Human Rights; Sharing Our Legacy: Indigenous-African Relations Across the Americas; Women’s Human Rights, Macroeconomics and Policy Choice; Rethinking Feminist Interventions in Urban Studies; Racialization, Racism and the University; Transnational Migration Trajectories of Immigrant Women Professionals in Canada; "Worked to Death": Gendered-Racialized Dimensions of Economic Security for Later Life Canadians; and Negotiating Sexualities: A Study of Youth and Development in Guyana. As in previous years, the CFR was honoured to support several visiting scholars including: Jin Haritaworn (London School of Economics and Political Science); Louise Johnson (Deakon University, Australia); and Anne Runyan (University of Cincinnati). 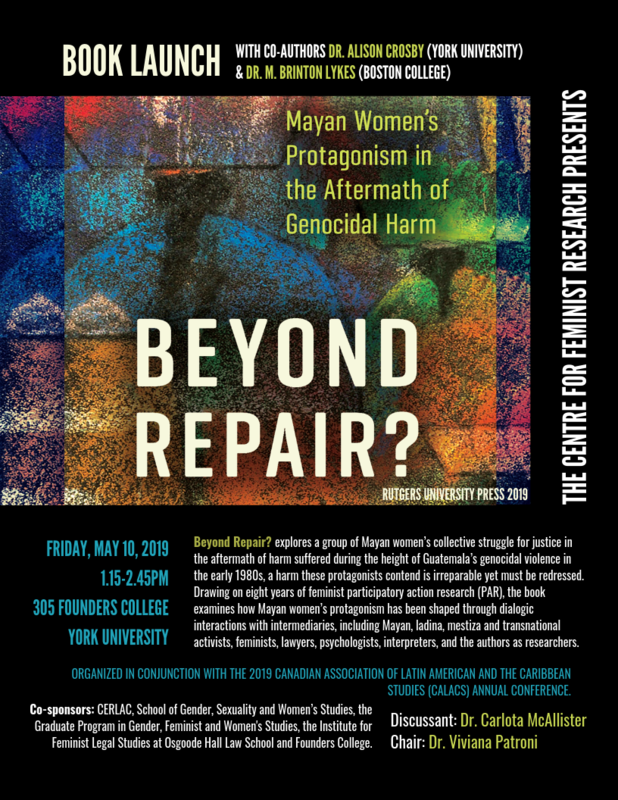 The CFR also hosted an international post-doctoral student, Francesca Mailoi (Italy), and an international undergraduate student, Ximena Ureta (Uruguay). Under Dr. Dua's leadership, the Centre for Feminist Research continued to deepen conversations about theory, activism, and social justice through a variety of activities and events, including, but not limited to, symposiums, conferences, and panel discussions during the 2012-2013 and 2013-2014 academic years. the CFR's 2013-2014 Annual Newsletter and the 2013-2014 Events webpage.